ARLINGTON, Va. — One of the many strengths of the National Association of Chain Drug Stores has been its advocacy role in public policy. In the wake of last November’s election and the resulting turmoil and uncertainty in Washington, that expertise takes on greater importance than ever. At the same time, with U.S. health care in a state of flux, it is essential that NACDS help the chain drug industry it represents prepare to navigate a future that is by no means clear. Since Steve Anderson took over as chief executive officer in 2007, NACDS has steadily enhanced its value to its members in these and other areas as well. 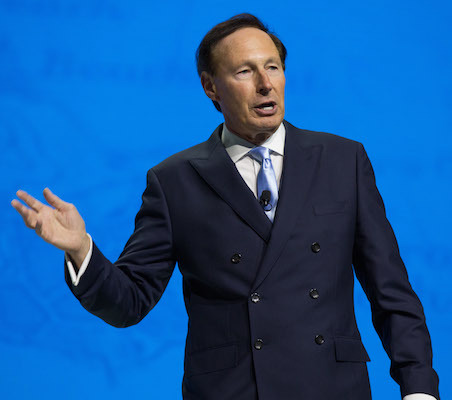 “The strength and the power of NACDS is that throughout the decades it has always been adaptable and able to deal with the business situation in which it finds itself to be really effective in terms of helping its members,” Anderson told Chain Drug Review. Vigilance also continues to be a strong point of NACDS. When House Republicans recently attempted to replace the Affordable Care Act with their American Health Care Act, NACDS succeeded in preserving prescription drug benefits and key provisions of the ACA for the pharmacy industry. The association also has continued to monitor developments at the state level and been swift in acting to defend the industry when called for. Anderson shared his views on what’s ahead for the chain drug industry in today’s uncertain business and health care environment in an interview with Jeffrey Woldt, vice president and editorial director at Chain Drug Review. Here is an excerpt. CDR: With the election of a new president and the Republicans taking control of both houses of Congress a lot has changed in Washington. What role will NACDS play in the age of Donald Trump? ANDERSON: NACDS always plays a valuable role in shaping public policy that impacts our members. And that is so true now. If the election had gone another way with Hillary Clinton sitting in the White House, we would have a whole different emphasis than we currently have with the Trump administration, because everything is up for review. But no matter who is in the White House, we always get guidance from our Board of Directors, and we aggressively advocate on behalf of the industry. There’s a lot going on in Washington — the attempt to reform the Affordable Care Act, tax reform, Tricare, pharmacist provider status, the border adjustment tax, regulatory reform and other issues — that we’re getting involved with. NACDS is an absolutely vital resource for our members in that environment. CDR: How do you view the Trump team? ANDERSON: Although you may see the senior Trump team in place, the administration’s entire team isn’t in place. For example, we may have a secretary of health and human services [Tom Price], but the real work gets done at the assistant secretary level below. That is true with the other agencies as well. CDR: It seems that the Republicans could not get together to repeal and replace the Affordable Care Act [ACA], even though they control the White House, the Senate and the House of Representatives. What happened? ANDERSON: The leaders of the House abruptly canceled the scheduled vote on the American Health Care Act [AHCA] legislation to reform the ACA, after it became apparent that a significant number of conservative and moderate Republican members would oppose the bill and not allow it to pass. Although NACDS obviously doesn’t set the agenda for Congress, once that agenda is set we are effective in implementing public policy positions that reflect the needs and wishes of the membership. NACDS did pursue successful advocacy efforts on the AHCA in order to preserve essential pharmacy benefits and provisions. The AHCA would not have repealed the average manufacturer price [AMP]-based federal upper limits [FUL] provisions of the original ACA. Also, while the AHCA would have allowed states to choose a block grant over a per capita cap for traditional adult and child populations in Medicaid, states would have been required to provide drug benefit coverage to these populations. NACDS was pleased that this provision was included after having worked with members of Congress and their staffs to protect pharmacy benefits in the Medicaid program. While the future of health care reform in the House and Senate remains unclear, NACDS will continue to monitor developments on Capitol Hill and in the Trump administration to ensure that essential chain pharmacy priorities are protected. If reform of ACA reappears in the House, it will have a very long road in Congress before portions of the ACA are repealed and replaced. CDR: The Affordable Care Act is still the law of the land. NACDS has taken legal action in the past on the AMP Medicaid reimbursement rule, which has saved the industry billions of dollars to date. NACDS recently filed a lawsuit in Washington state on Medicaid pharmacy reimbursement. How important is that lawsuit? ANDERSON: The NACDS lawsuit is extremely important to our members and the industry. Since the AMP rule, based on the ACA, was finalized by the Department of Health and Human Services Centers for Medicare and Medicaid Services [CMS] in February 2016, NACDS has been closely monitoring activities in the states and at CMS to make certain that they are complying with the rule, and with applicable federal and state laws. NACDS determined that we would litigate when necessary if states violate the AMP rule. On March 30, NACDS, along with the Washington State Pharmacy Association and the National Community Pharmacists Association [NCPA], sued the State of Washington to stop a substantively and procedurally flawed rule that would pay pharmacies below their cost to dispense Medicaid prescriptions, and that would jeopardize reliable access that is responsible for enhancing patient health and for preventing more costly forms of care that result from untreated conditions. Our motion seeks to halt further reimbursement cuts until such time as Washington state properly implements Medicaid reimbursement rates that cover the actual costs that pharmacies incur when they serve Medicaid patients, as required by law. CDR: What are your arguments in the NACDS lawsuit? ANDERSON: At issue is a rule by the Washington State Health Care Authority that changes the basis by which the agency determines pharmacies’ cost of acquiring pharmaceuticals, thus reducing reimbursement for pharmacies for medications dispensed to Medicaid patients. Contrary to the federal AMP rule finalized by CMS in February 2016, the Washington state rule does not at the same time make required adjustments to account for another aspect of pharmacies’ costs — the professional dispensing fee that must cover costs. The current dispensing fee in Washington state ranges from $4.24 to $5.25 per prescription — significantly lower than the cost of dispensing identified in studies conducted by other states and experts. An independent study commissioned by NACDS and NCPA found that the cost of dispensing in Washington state is $10.48 for Medicaid prescriptions and $11.65 overall — higher than the national dispensing costs of $10.30 and $10.55, respectively. In addition to violating federal law, the state also violated rule-making procedures. The state informed pharmacies after the formal comment period, and after the final rule, that dispensing fees would not be adjusted. As a result, pharmacy did not have an adequate opportunity to comment on this matter, as required by the Washington State Administrative Procedures Act. CDR: At the NACDS Regional Chain Conference you said that, amidst all the uncertainty, the association needs to reorient itself and act like a startup and function like a think tank. Can you elaborate on that? ANDERSON: Each year, NACDS develops a strategic plan that is approved by the Board of Directors. It’s close to a 200-page document, and it focuses on what our board has asked us to engage in that impacts every aspect of NACDS’ activities, issues and programs. In addition to broad strategy, the plan includes the tactics we will use to implement that strategic plan. This year, NACDS added a new aspect that we’re calling our Future Value Targeting Initiative, focused on how we can look out into the future. The future is whatever people perceive it to be, which is often pretty short, particularly in health care. The goal of NACDS Future Value Targeting is to ensure that NACDS gives necessary thought to positioning the association to deliver value to the membership in the future operating environment. We picked up an idea from a front page article that was in the Harvard Business Review about “shared value.” “Shared value” refers to strategic collaboration among partners who pursue financial success in a way that also benefits society. I was at a meeting recently with some colleagues from other associations who represent various industries, and we discussed the new Trump administration and the new political order that we have in Washington as well as in the states, since Republicans have made great strides in the state legislatures and the statehouses. They asked themselves, how are we going to deal with those issues? 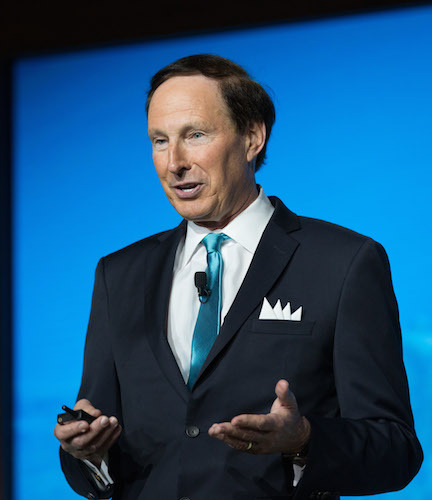 NACDS was in a much better position in terms of communicating long-term messages, a lot of which Martin Otto — our chairman this past year — has talked about in terms of NACDS being a leader in providing a thorough end-to-end health care analysis and education, and offering solutions in collaboration with others across the entire system. I’ve been in the association field for a long time, and I love it, but there’s a certain connotation that some people in the country have when they hear the word “association,” that they aren’t really dynamic groups. They’re rather inflexible and rigid. I think it’s important that associations start thinking like they’re a startup and a think tank, and not like an association. It’s fascinating. Martin and I had a discussion in April 2016 before he became chairman, and we used those terms — startup and think tank. And they’re really relevant now with the new political order in Washington, and as we lead NACDS to a bold, innovative and creative future. CDR: So those terms arose from your interaction with Martin? ANDERSON: It started with the two of us, but we engaged the entire NACDS Board quickly and received great feedback. We presented our 2017 strategic plan for the coming year in December at our NACDS Board meeting in New York. We had a separate document focusing on Future Value Targeting. CDR: What is the focal point of future value targeting? ANDERSON: Future Value Targeting responds to the emerging consensus that NACDS should enhance its case for the industry by positioning it in terms of its broader societal benefits. These come through improved approaches to health, well-being and other benefits. A key aspect of this work will require the exploration of new strategic partnerships with others. If you think about it, there’s not a member of Congress who doesn’t want to make sure that his or her constituency has the access to health care that they need. The NACDS leadership has done an extraordinary job, with the NACDS RxImpact Day on Capitol Hill program that we started nine years ago. I get good feedback from our board members because they meet with the senior leadership of Congress in Washington, in addition to all the other meetings that they have in the states where they have stores. We’ll sit down with members of Congress and pick up on a conversation that we had last year and throughout the year when we are discussing the value of pharmacy, a conversation we never had before we started this nine years ago. We get the legislators into our members’ stores so they actually understand what our companies do on behalf of their constituencies. So it’s all tied into that and how we communicate on a lot of those messages. Martin has raised some good issues in terms of the inefficiency of the health care system and the impact that has. And pharmacy is part of the solution. That’s one of our primary messages. CDR: Over those nine years have more members of Congress come to understand that and appreciate what pharmacy does? ANDERSON: Oh, yes. But because we have these wave elections, where it seems like one chamber of Congress is turning over every two years, if not both, we always have a lot of new members of Congress we have to educate. We have a lot of those new members now. But those that will rise to the rank of leadership in the House and the Senate or become a chairman of a committee are people who have longevity in their seats. We’ve always had good communication with them over the years. CDR: One thing that seems to be unanimous among business leaders is that there’s too much regulation. And it’s not a simple task to get rid of existing regulations. ANDERSON: Following the election of President Trump and because of his focus on reducing regulations on business, NACDS launched a Regulatory Reform Initiative in December 2016. As part of that effort, two weeks ago NACDS sent a letter to President Trump and copied senior people in his administration detailing NACDS’ priorities for federal regulations that require reform, repeal or replacement. NACDS worked with our members to identify chain pharmacy’s regulatory reform priorities. NACDS will pursue additional advocacy activities on our regulatory priorities in the letter with the Trump administration, relevant agencies, and House and Senate offices. In addition, President Trump also issued an executive order asking the Office of Management and Budget to reorganize and/or eliminate federal agencies, components of agencies and agency programs. NACDS is working with our members on the potential for commenting on federal agency reorganization or elimination as part of the NACDS Regulatory Reform Initiative. CDR: In light of all that we’re talking about — the turmoil in Washington, Trump being pretty unpredictable — how much more difficult does that make it for NACDS to try to influence overall health care policy? ANDERSON: With the turmoil in Washington, it’s important to have a strong NACDS to navigate those waters for our members. We can’t control the agenda. We don’t tell Congress what they have to consider. Once they start to work on an issue, we come in and attempt to advocate on behalf of our members. We get those directives from our Board of Directors implemented. So we have to play the breaks. We have to know how we want to get to where we want to end up. Anything you learned in eighth grade civics class about how a bill becomes the law isn’t the way it works these days. That could give you a rough idea in a perfect world. But with our political situation and our policy situation, we are far from a perfect world. That makes it difficult, but at the same time the process allows us to get our message to be understood. Our message centers around what the pharmacy profession is doing and what members of Congress can do to help their constituents have better health care. We have a great story to tell on behalf of our members, and we show members of Congress how we can help them achieve what they want to achieve. And it is a bipartisan message. If you look at the NACDS-advocated legislation over the last five or six years, they’re very bipartisan in approach because pharmacy provides a market-based solution that helps solve some of the larger health care problems. CDR: Is NACDS getting more involved in issues with a global reach? ANDERSON: We represent companies, in our chain and associate member categories, that truly have a global reach. With the Affordable Care Act shelved, Congress and the Trump administration have now pivoted to tax reform, including a consideration of a proposed Border Adjustment Tax [BAT]. NACDS has adopted a position of opposing the BAT, and we are working with other members of Americans for Affordable Products — a broad coalition of consumer and business interests — to oppose the BAT. The BAT would levy corporate income taxes on income derived from goods sold within the U.S., even if they are imported from overseas. Conversely, any income from products manufactured in the U.S. and sold overseas would no longer be subject to corporate income tax. The BAT would impact pharmaceuticals and other products. There are issues for both generics and branded prescription products as they relate to what comes in and how the product is repackaged, and where the tax is going to be assessed. As a pharmacy issue, the BAT has a big impact on a specific area, but it has a profound impact on the rest of the store as well. Once again, we take our leadership from the Board, and they have determined that this is a big issue for us. CDR: The third pillar of your strategy is communications. How are those efforts evolving? ANDERSON: Evolving is exactly the right word for it — just as it should be. Storytelling is one of the vital functions of an association, and at NACDS we have a powerful story to tell due to the amazing work of our member companies. We are evolving the story with the advancement of the industry, according to our goals and strategies in the current operating environment, and given the changes in communications mechanisms that are happening so quickly. We have a vast and growing network of NACDS RxImpact grassroots advocates who are there every day to prove that point. We are showing legislators that we are there to give them something powerful that they can be “for” in health care policy, and it is supported by their constituents. Finally, speaking of the communications platforms of today, you can go to the microsite at AccessAgenda.NACDS.org and see how we are positioning pharmacies as the face of neighborhood health care today. It is really exciting to be able to tell the story of our members through NACDS. *Editor’s Note: To read the full interview with Steve Anderson, please see the April 24, 2017, print issue of Chain Drug Review.